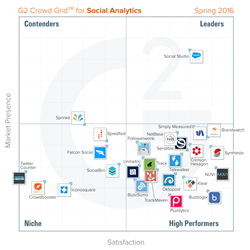 G2 Crowd, the world’s leading business software review platform, today released the Spring 2016 Social Analytics Software Grid report to help businesses make the best social analytics technology decision. Social Studio was named a Leader in the report, receiving strong customer satisfaction scores with a large market presence. Brandwatch, Synthesio, Simply Measured, NUVI, Crimson,Hexagon, NetBase, Sendible,Talkwalker, Buzzlogix, Klear, Oktopost, Followerwonk, TrackMaven, Tracx, Unmetric, Plumlytics, and BuzzSumo were named High Performers in the report, earning strong customer satisfaction marks with smaller market presence scores. NUVI earned the highest overall satisfaction score, while Social Studio earned the highest overall market presence scores. Users enjoyed social media platforms — Many social analytic products combine features in social media management, social media monitoring, and social customer service. Users frequently noted these features as beneficial in reviews, and enjoyed the ability to combine all their social tools in one unified platform. Sentiment analysis not perfected — Users across the Social Analytics category pointed to sentiment analysis as an area in need of improvement. Many users cited issues such as incorrectly coding language, not picking up on slang, and a difficult training process for teaching their product’s sentiment analysis how to read language. Inconsistent data — Some users were frustrated in certain products’ data inconsistencies. This caused separation among the products in the Social Analytics category, with the products that experience data inconsistencies suffering lower satisfaction scores. The report is based on more than 660 reviews written by business professionals. Of the roughly 276 products listed in G2 Crowd’s Social Analytics category, the ranked products each received ten or more reviews to qualify for inclusion on the Grid.